Women hold important positions on the Kellogg School faculty, but they also occupy key roles on the administration. 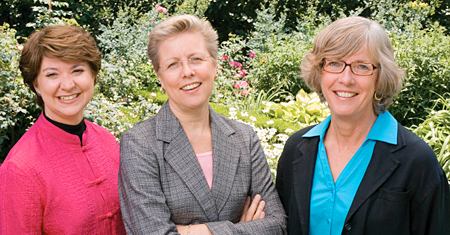 Longtime Kellogg staff includes Carole Cahill, Erica Kantor and Theresa Parker. They provided Kellogg World with some insights into their contributions. Role and responsibilities: I'm responsible for facilities management and construction projects at the Donald P. Jacobs Center. Much daily maintenance and repair goes on, which my colleague Mariellen Gibson handles so well, as well as the challenging annual construction and remodeling projects planned throughout the year and executed in the summer. I help set the scope of the projects and work with the university architects, contractors and designers to ensure the projects stay on target. I also play a human resources role, interfacing with the university's HR office to process job postings, hiring and promotions. When I started at Kellogg, we had 45 non-faculty employees; today we have 210 staff. In addition, with the help of a lot of dedicated people, I coordinate special events for the dean's office. For instance, this year we hosted 4,000 people for the convocation lunch. Biggest recent challenge: We have added many staff positions and needed to ensure we did so in a logical way by carefully identifying need. We've been very successful and our administrative units have built great teams. Best thing about working at Kellogg: The students, the staff, the faculty, the ideas, the energy, the challenges, the fabric of Kellogg. There is something magical here. If you weren't here, you would be...: A golf pro! Role and responsibilities: My core job is human resources, helping create an atmosphere at the Allen Center that offers staff a mutually supportive, professionally nurturing environment. Some of our goals include finding synergies for shared services between the executive degreed and non-degreed programs, and to continually improve the Allen Center experience for our customers in the increasingly competitive world of Executive Education. Biggest recent challenge: My personal challenge is not having student contact after 17 years of working with the Executive MBA program. I do miss the students. I actually just became a Kellogg alumna myself, having completed the Kellogg Management Institute in May. I wanted to experience the program from the customer side, and that experience really drove home just how good Kellogg is, from every standpoint. Best thing about working at Kellogg: The Kellogg culture of teamwork and camaraderie spills over into day-to-day operations, which is very positive. Every day we come in contact with very interesting people from all around the world - staff, students, faculty and alumni. If you weren't here you would be...: In education somewhere. I started my career working with children with special needs. Role and responsibilities: My overarching goal is to provide high-quality information to Dean Jain and the school's executive leadership to inform strategic planning for Kellogg. I work closely with the dean, the senior associate deans and the administrative directors to assist in annual program planning. A critical aspect of my responsibility is to articulate Dean Jain's overall vision as we set budgets in areas such as financial aid, student affairs, career management, development and alumni relations. Biggest recent challenge: Changes in the marketplace for non-degreed and, to a lesser extent, degreed programs. Since 9/11, corporations have been faced with significant budgetary reductions. As it did for all our peer schools, this fact decreased enrollment for our non-degreed programs. Our enrollments have rebounded, but the overall market has matured, with many new players entering the Chicago area. To ensure Kellogg remains the leadership school of choice, we have invested more money into marketing and are exploring creative ways to serve the business community's continuing education needs. My role in this has been to track our financial progress and work with senior management to identify and service new customers. Best thing about working at Kellogg: The culture of innovation here and our highly productive, creative faculty, and our engaged students. I came to Kellogg in 1998 after six years at Northwestern University's Institute for Policy Research, where I was writing and administering grants. Kellogg attracted me because it provided an opportunity to be involved in the management of a professional school with a large portfolio of programs. I knew I'd be working with people who are committed to providing top-notch business education in entrepreneurial ways. If you weren't here you would be...: Working with an organization like the MacArthur Foundation, which has as its mission the lasting improvement of the human condition. I feel that's very similar to the work I do at Kellogg.